The Down Syndrome Association of Hamilton is proud to present “Spring Swing”, an evening of social gathering with dancing, light fare, fun and games for adults 19 years and up. 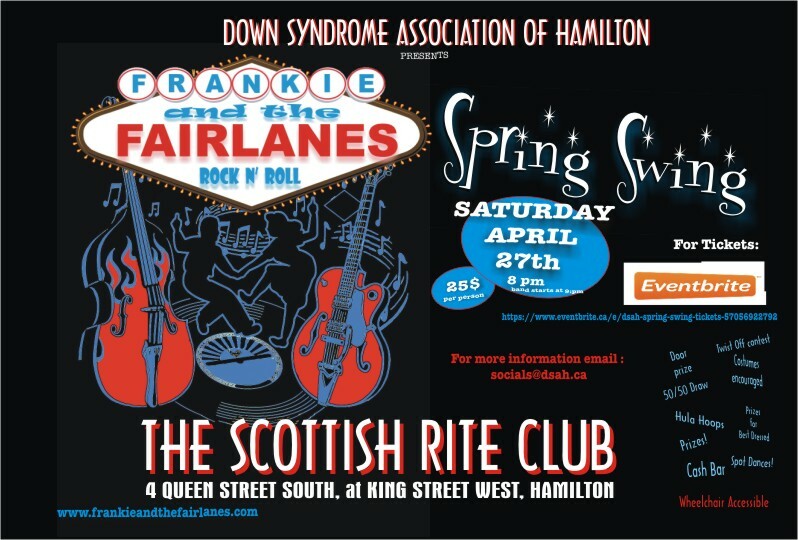 Dance the night away while being entertained by Frankie and the Fairlanes in the Grand Ballroom of the Scottish Rite Club of Hamilton. Need a night out with great music and awesome company? Come and join us for the first DSAH Spring Swing dance. Get your tickets today – $25 online and $30 at the door. A show not to be missed with Frankie and the Fairlanes. Frankie and the Fairlanes add a dash of humour as well as lighting, props and costumes and the evening is truly unforgettable. Get your tickets today!